Lighting, Beacons & LED lighting is a big part of our business. We have just opened a new LED shop in store. So you can come along and actually get your hands on the product by switching them on and seeing them work. We consider this to be a great help when trying to make the right choice for your vehicle. 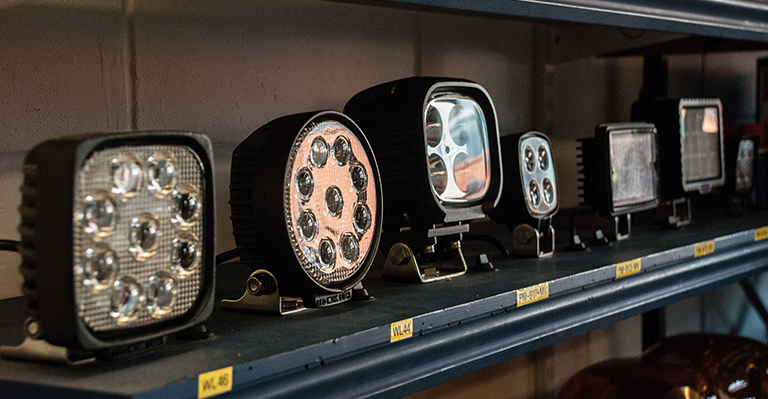 We stock a large range of vehicle warning lights for agricultural, breakdown and works vehicles, and carry a full range of rear cluster lamps, marker lamps, headlamps and 12 + 24 volt bulbs are available. Our New LED products include; Marker Lamps, Work Lamps, Warning Flasher Lamps, Beacons, Light Bars, Rear Lamps, Day Running Lamps and many more….. So why not pop in and have a play; our friendly, experienced staff are available to offer help and advice. We can also fit our products – if required! Not sure which light you need? Please complete our ‘Contact Us‘ form or telephone our expert lighting advisors today on 01553 765211.